A colour photograph showing the Canadian Pacific Railway bridge at Rossland Road. The CPR bridge was demolished in December 2001 and replaced with a concrete bridge in 2002. 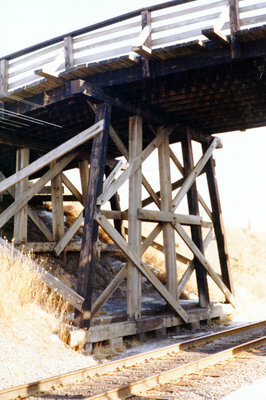 Rossland Road CPR Bridge, 1999, Andy James, Whitby Archives A2013_022_002.